So the party came and went and we all survived. Sunny weather helped, as seven boisterous boys bounced around on the sixteen foot trampoline. The piñata took some bashing and the cake looked marvellous, if I do say so myself! I even made mini cakes with cake reject number two. Love my mini ninjas! It’s just sinking in that I no longer have children under five. When reading my favourite blogs about the toddler years, I feel a mixture of nostalgia and relief. Not that I’m under any illusions that it magically gets easier now my youngest is five, or now they’re both at school. But I sense a shift. I can feel myself slowly re-emerging from the seven years of sleeplessness and doubt. The constant fear of losing one of them is so familiar now it’s like a cranky neighbour I can mostly ignore. I want to do things for the whole family, not just the children. The two go usefully hand in hand. I have a sudden urge to reclaim the house, to have child-free/toy-free spaces, to erect some boundaries. I want to shift our attitude to food and eating. So I’m busy and preoccupied and pushing them to entertain themselves more after school. It’s a work in progress. Particularly the food. After baking numerous cakes (each flatter than the last) and watching other children eat their party pizza while my son refused, things came to a head. I listened to advice from a friend, who specialises in getting kids to eat veggies, and it brought the self-doubt back. But, walking away, I knew her approach was not for me. A little internet research revealed a “long game” approach that fits much better. It’s based on a division of responsibility: As the parent, my responsibility is to provide balanced, nutritional meals. It is the child’s responsibility to eat or not eat. There are no threats or rewards. Pudding is not held back. There is no nagging or angst. It’s hard, letting them have pudding without eating a scrap of dinner. But I agree that pudding shouldn’t be a reward for eating dinner. It gives sweet stuff too much weight. That said, my son hasn’t eaten dinner in days. But he’s catching up at breakfast (three Weetabix and three yoghurts this morning!) and meal times are almost enjoyable. No nagging and pleading and ultimatums and tears. Lovely. I’ll see how long it lasts! So that’s it. A new era. Let’s hope it brings happy children, happy families, and a lovely book deal! It’s been nearly two weeks since I wrote my review of the Deliciously Ella cookbook and I thought I ought to give an update. Between surviving half term (with trips swimming, to the gym, the zoo, the garden centre, and HOURS of craft), I have been slowly gathering the ingredients to try some more of Ella’s recipes. The first batch I made with avocado and tomato, rather than olives and raisins, and I didn’t add any date or maple syrup. Instead I fried it all in olive oil. Delicious, quick and easy. The second batch (which I was brave enough to try on hubbie after my first go) I swapped avocado for some cranberry cheese that needed using up. Although not dairy free, like the first one, it was just as delicious. Even hubbie said it was nice. So that’s a keeper. The second recipe I tried was not quite so successful, but only because I had failed to gather all the necessary ingredients and I don’t own a food processor. My search for an affordable food processor that might manage to make nut butter is an ongoing challenge. For now I’m using the mill adapter for my blender (which has sustained a little damage as a result) and my Philips handheld blender, which is doing an amazing job considering. Anyway, the second recipe was the Sweet Potato Brownies (p166), which are made using sweet potatoes (obviously), Medjool dates, ground almonds, brown rice flower, raw cacao powder and maple syrup. I had everything but the rice flour and ground almonds, so I chucked a scoop of rice in with some whole almonds and ground them in the mill. I should have just used plain flour and accepted that it wasn’t 100% gluten/wheat free. It’s not like I’ve given up wheat or sugar completely, so it wouldn’t have mattered. As it was, the rice didn’t grind up fully and the brownies ended up teeth-breakingly crunchy. BUT, and it’s a big but, they are delicious. Seriously. No butter, no refined sugar, and actually some vegetables, and they are yummy. So I will buy some rice flour and I expect these will become a stock bake. I dread to think how many calories they contain, with all those nuts and maple syrup, but at least they’re sort of healthy. I still find the book frustrating to use. I often can’t find the recipes I want, and I wish they were ordered by type (meal, salad, dessert) rather than ingredients. I still halve the recipes and find that makes plenty. But I am glad I bought the book, even if my wallet isn’t! I’m sure my body will thank me in the end. What is it about us humans that we do crazy things under the delusion that they’re a good idea? I woke up yesterday full of cold (again!) and this weekend should have been about survival. Instead I took my son shopping yesterday to buy my daughter’s birthday gift. Two hours of wandering around shops looking for bedding, with a three-year-old in tow, isn’t that clever. I did at least take a lie-in this morning, after writing my blog post, and didn’t get up until 10am. But then, instead of sitting in a corner quietly reading my book while the kids played (as suggested by hubbie) I started on a baking spree. I don’t do baking or cooking, unless I want cookies and there aren’t any in the house. I’m the only person I know who isn’t a foodie, doesn’t enjoy cooking and hates making everything from scratch. But, today I made macaroni cheese, fruit crumble and a loaf of bread, all from scratch. What the…? Actually, there is some logic. Firstly, although the kids were playing nicely by themselves, I knew that would end abruptly if I sat on the sofa with a book. 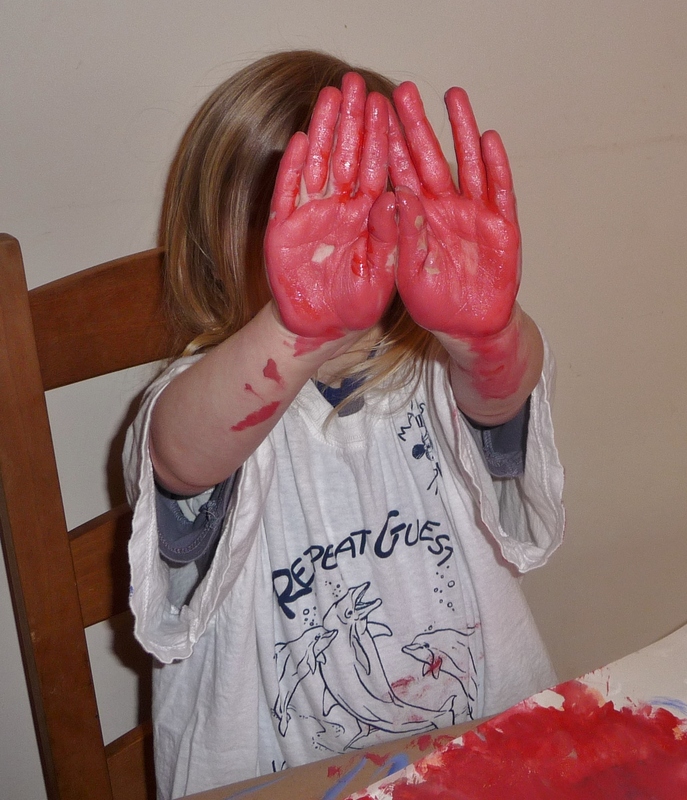 If Mummy’s busy they can mostly be relied on to do things they think I might not approve of. I watch them surreptitiously to make sure it’s nothing dangerous, and everyone is happy. Secondly, it’s ‘that time of the month’ and comfort food was required. A nice broccoli and cheese pasta bake and some fruit crumble and custard was just what the doctor ordered (well, probably not, but you know what I mean!) I managed to make a hash of mixing powdered custard, ending up with a lumpy goo twice, but it tasted okay. Thirdly, I bought a new loaf tin a few weeks ago and I haven’t really had a chance to try it out. I made banana bread in it, but think I got the recipe wrong because it didn’t rise (although it tasted okay!) I searched and searched online for an easy wholemeal bread recipe, for my basic cupboard of ingredients, and found one on Delia’s site. Delia is one of the UK cooking gurus, so I thought what can go wrong? 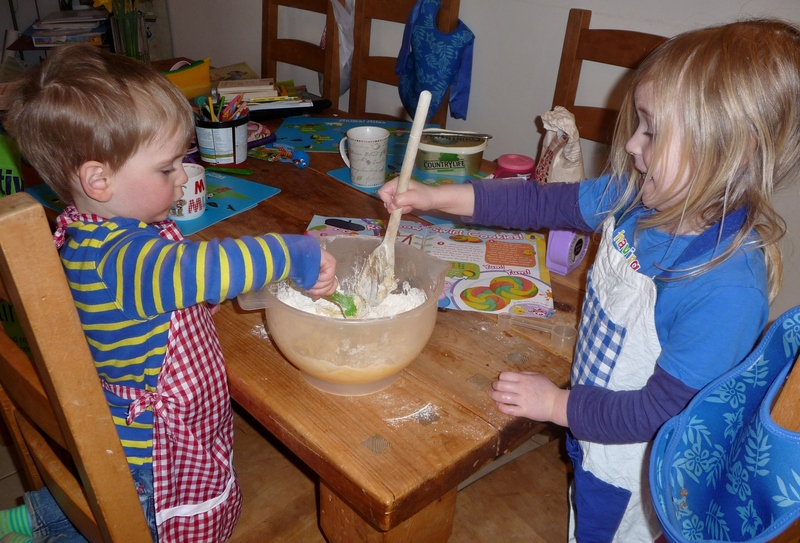 The recipe certainly is easy, requiring no kneading and only a few basic ingredients (flour, salt, sugar, yeast, hot water). It rose as she said it would, to fill the tin, and baked to perfection, sounding lovely and hollow. It looked lovely, smelt great. But it feels like a house brick. Tastes like one, too. So my search for the perfect easy bread recipe continues! My sister swears by a no-knead one that cooks for hours (or sits for hours, I can’t remember) but I’m not very patient. And, actually, I’m happy to do a bit of kneading if it means light and fluffy bread! To top off my day of domesticity, I did ninety minutes of ironing while the kids played outside in the rain and then picked away at their tea. It’s a nice feeling to know it’s all done, but my head is fit to burst now (especially as they’re watching Barney for the tenth time in two days and that singing goes straight through me!). Thankfully hubbie did bath time, although that seems to have finished him off (he also has a cold!) What a pair we are. Roll on spring and feeling well again. And thank goodness it’s bedtime (for the kids and probably for me, too!) How was your weekend? What happened to painting the paper? I made the mistake of thinking I could write my post with the kids around this morning. Yesterday’s post that is – so with a 10am deadline. They watched two hours of TV and I just about managed to write the top half. With much pleading and trying to watch them cut paper, scooter, sweep and bounce at the same time, I managed to write the 750 word installment by 10.45am. No matter how exhausted I am I have to make sure it’s written before bedtime if I know hubbie’s working the next day. Oh how I have taken him for granted these last three months! Anyway today hasn’t really recovered. 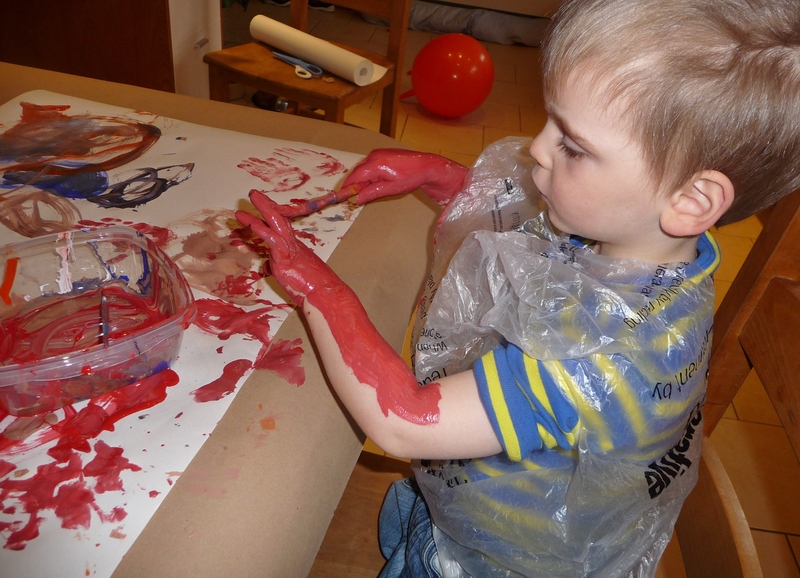 We’ve done cutting and sticking, scootering and bouncing, painting on paper, painting our hands, painting in the bath. Cleaning the bath. More TV. Story reading, cookie baking (much squabbling over who was in charge of the bowl) and teddy tea parties. Now at 5pm I’m finally free to walk the dog and think for five minutes together without trying to decipher two simultaneous conversations. I’ve tried really hard not to tweet every ten minutes or check my email today but since we put the PC in the kitchen that’s been hard. When I did switch the screen off and sit down to the teddies’ tea party the game lasted all of three minutes before they were off onto something new. So I tidied the playroom, loaded some laundry and took the cookies out the oven. Maybe they get their short attention span from me? I’ve always been scattered in my approach to getting stuff done – it was on most appraisals when I worked for a living – and generally it used to be okay. What I lacked in efficiency I made up for in lists and long hours. In those days I had enough sleep to remember everything that needed to be done.Today I realised I haven’t done a piece of artwork for a friend that she needs next week! Damn that short-term memory loss caused by sleep deprivation! These days my scattered approach leads to grumpy kids and half done chores all over the house! I’d like to say I’ll change but I think maybe I’m just at the point where I’ll pay for the kids’ therapy instead. The hostel car park was the size of a postage stamp. Claire had been fortunate to arrive the night before just as someone was leaving. Now the Skoda was so tightly wedged in she had no hope of reversing out without damaging someone’s car. It was tempting. Who would know? She looked up at the buildings all around. Someone’s bound to see, knowing my luck. So, do I go in and wake a bunch of backpackers to find out who is blocking me in or wait until everyone wakes? She inhaled and the morning air froze her nose and throat. She laughed as her childish shout startled some pecking pigeons. Slumping against the back of her car, Claire tried to decide what to do. Her brain still felt muffled, as if it was floating under water. The doctor had said it might take weeks for her to recover from her concussion. I’m not sure I’ll notice when it’s healed. My mind seems permanently foggy these days. Think Claire, think. And then it came to her. She remembered reading in the hostel notes that it was close to the train station. It seemed crazy taking the train when she had a car but it would be nice to leave the Skoda behind for a while and pretend to be a normal person again. The walk improved Claire’s mood and she was almost smiling by the time her iPad told her she had arrived at the train station. She stared at the dirty-white temporary buildings and the single railway line. Train station is a bit of an overstatement. Bugger. God knows when the next train will chug through here. They’re probably still run by steam. As she thought the words she heard the unmistakeable sound of an approaching train. Stuffing her iPad into her bag she ran for the platform just as a two-carriage train pulled in with a whoosh of brakes. Claire tugged open the door to the nearest carriage and jumped on board. A dozen calmly-seated suits turned to stare as Claire tumbled into the carriage, red-faced and panting. She smiled automatically and slid into the nearest seat, eager to hide her rosy face. With a jolt the train pulled away and Claire prayed it was actually heading for Sheffield and not Manchester. Please don’t let me end up there today. I’m bound to bump into someone I know and I look like something the cat threw up. She pulled her fingers through her tangled hair, wishing she had taken time to shower and dress properly. There had been only one thought on her mind as she left the hostel and that was to get a new phone. Outside the window trees and fields flew past, before they passed through Grindleford station and disappeared into a tunnel. Claire stared at her reflection in the dark window and wondered when she had stopped wearing make-up. I guess it doesn’t matter if we are headed for Manchester: I don’t suppose anyone would recognise me. The train emerged from the tunnel into a grey landscape and her image vanished. A voice echoed down the train calling for tickets. Claire dug in her handbag for her purse, feeling her heart thudding against her ribs. I’ve never boarded a train without a ticket before. I hope he’ll let me buy one and not make a fuss. She felt the heat return to her cheeks and wondered if it would have been less stressful to wake a hostel full of people to ask someone to move their car. Why is nothing every easy? Today started with pancakes and paddling pool fun. 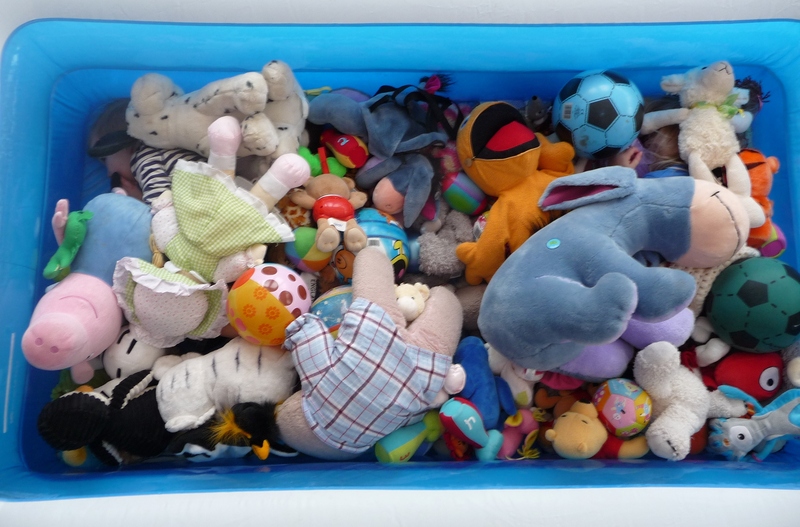 When we haven’t had a chance to get outside for a while because of the nasty weather (our kids hate the cold) we inflate the paddling pool and fill it with soft toys. Thankfully we have a big playroom as they spend most of the time running round the edge of the pool and diving into the teddies. Daddy rather loves it too. It’s about the only time I am at peace with the three laundry baskets of cuddly toys that clutter the playroom. The kids played ‘spot the child’ by hiding under the teddies. Can you find them both? Pancakes is one of the plus points of hubbie being unemployed. When I need to get him out of bed early I make pancakes. I’ve discovered there isn’t much he won’t do for a couple of stodgy thick maple-syrup-soaked circles of batter. Suits me. 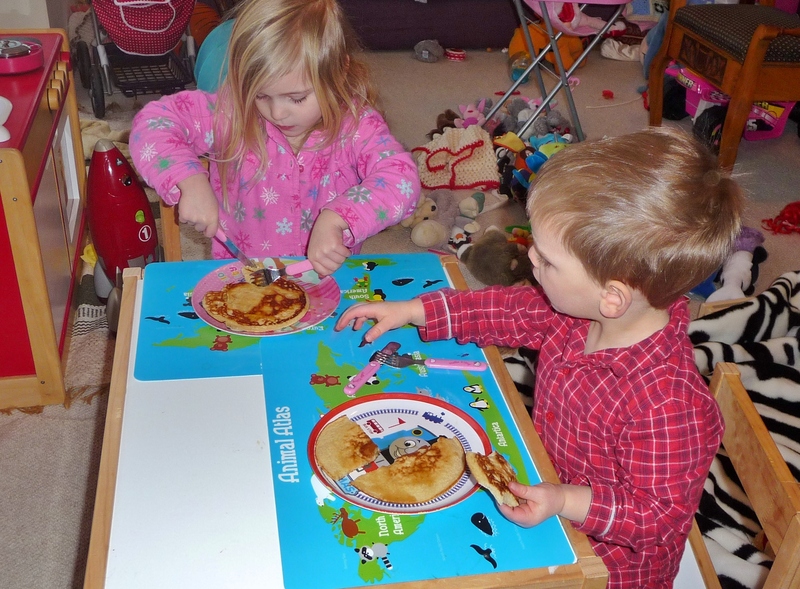 They’re easy to make and they contain less sugar than the usual breakfast the kids have, even with the syrup. Daddy has taken the kids with him on his errand run this morning so I am of course torn between work, cleaning and dog walking. Think I will combine one and three by taking the dog on the 45-minute circuit and trying to come up with my bombshell/cliffhanger last post for February. We’ve got a birthday party this afternoon – my favourite kind: DVD and pizza at a friend’s house. I’m sure it’ll descend into bedlam as it will consist of four families with ten children between them all who have known each other for years. I’m going to make flapjack with the kids and do a bath-with-hairwash before we go so I’ll probably be propped up in a corner trying to keep my eyes open! “Josh, what’s going on?” Claire had been watching the door to the lounge for two hours and the words launched themselves across the room without her volition. In her head the words had sounded hard-hitting but out in the open they whined like a nagging-wife. She inhaled through her nose and watched silently while Josh crossed towards her without making eye contact. An aroma of smoke, cheap aftershave and sweat came with him, making Clare feel lightheaded, as if she’d been working late on an assignment for weeks on too much caffeine and not enough sleep. “That’s good.” Josh nodded and looked around the room. “Where are Beth and Chloe?” Claire winced at the sarcastic tone in her voice. “It’s not like you to ask.” Claire patted the sofa next to her but Josh chose the one on an angle. He perched on the edge of the seat, leaned forwards and rested his elbows on his knees. He was close enough that Claire could feel his breath on her face. She guessed his lunch to have been spicy pot noodle and wondered if she could sit back without offending him. His eyes were dark with worry and something else. Fear. A strong desire to hold him and shush him began to build in Claire’s chest. She ignored it, settling for loosely clasping his hands, mirroring his posture. She waited while he sat, head low. His hair flopped forwards and she would have pushed it back except it was too greasy to touch. “You’re the closest thing to a friend I have.” Josh’s voice came, muffled, through the tangle of hair. Claire’s eyes opened wide but she kept her lips closed. He raised his head and pinned Claire with an intense look, as if urging her to listen without judgement. “Yes. I Skype when I’m in a city and can scrub up, but mostly I tell them I’m too busy.” He caught his lip between his teeth and looked over Claire’s shoulder. “Oh.” Claire wasn’t sure what to say. She tried to imagine how she would feel if a family member disappeared for three months. Then she realised she’d only spoken to Robert once since Christmas and came to the conclusion she probably wouldn’t notice. Claire wanted to say, which bit? The fact you’ve been living like Stig of the Dump trying to bed every woman you meet or the bit where you only shower and shave to convince your Mum you really are a hot-shot doctor in an English hospital. She remembered his advice when Ruth had called with her news. He really is a hot-shot doctor. Why the pretence? Forget Days of Our Lives, I’m turning into Miss Marple. She caught his anxious gaze and realised he was waiting for her to respond. Josh reeled from the words, his head snapping back as if from a physical blow. He dropped Claire’s clasp and ran a hand through his hair. Claire’s eyes narrowed at his reaction, wondering if her words had been too harsh. She had only meant his lying to his Mum but now she wondered if he had more troubling his peace of mind than he had let on. Josh cleared his throat and sat back in his chair. He folded his arms and looked over to the window although the dark skies outside meant all that could be seen were reflections of the hostel lounge. “Who is Fiona?” Claire felt a flutter in her gut but ignored it. She didn’t want to be Miss Marple anymore.